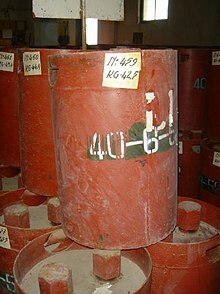 Soviet chemical wappens canister frae an Albanian stockpile. A chemical wappen (CW) is a specialised munition that uises chemicals formulatit tae inflict daith or hairm on human beins. The Organisation for the Prohibeetion o Chemical Wappens (OPCW) states: "The term chemical wappen mey an aa be applee'd tae ony toxic chemical or its precursor that can cause daith, injury, temporary incapacitation or sensory irritation throu its chemical action. Muneetions or ither delivery devices designed tae deliver chemical wappens, whether filled or unfilled, are an aa considered wappens themsels." ↑ "Types of Chemical Weapons" (PDF). www.fas.org. Federation of American Scientists. Archived frae the oreeginal (PDF) on 2017-03-03. Retrieved June 27, 2016. ↑ "Brief Description of Chemical Weapons". Organisation for the Prohibition of Chemical Weapons. 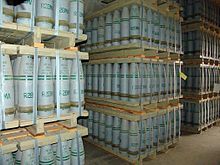 Organisation for the Prohibition of Chemical Weapons. Retrieved October 21, 2014. This page wis last eeditit on 30 Mairch 2018, at 14:22.